The Vergers Voice: Presiding Bishop-Elect Knows Vergers! Today, the 78th General Convention elected the Right Reverend Michael Curry, the 11th Bishop of the Diocese of North Carolina, as the 27th Presiding Bishop of the Episcopal Church. He will succeed the Most Reverend Katharine Jefferts-Schori who will complete her nine-year term on November 1, 2015. When invested at National Cathedral in Washington, DC, Bishop Curry will become the first African-American presiding bishop in the Episcopal Church. This election was, of course, one of the most highly anticipated events at the convention. The buzz in the "got vergers?" exhibition booth at General Convention has been growing over the past few days about who would be elected of the four highly-qualified candidates. When asked about the possible election of Bishop Curry, one member of the clergy delegation summed up the general consensus well when he said, "He would do an amazing job - most of all in energizing the church to attract new members which is what we feel is so important for the Episcopal Church today." Another lay delegate added, "He would make a phenomenal Presiding Bishop and I know if he's elected we would have an exciting, engaged, and energizing leader of the whole church." Bishop Curry answered questions posed by the deputies on Wednesday, June 24th. Among his statements was this memorable opinion, "The presiding bishop must be two kinds of CEO - a chief executive officer and a chief evangelism officer." Asked how he would live into the fiduciary, legal and corporate responsibilities of a chief executive officer while also being the chief evangelism officer, he said he would find "the best and most capable people" to run the organization, but he cautioned that just having people "who know how to count and know how to invest and know how to take care of the books is not enough. There's got to be a reason for doing it," he said, explaining that the reason is to enable the witness to Jesus that must be the center around which the structure of the church is built. It is also extremely exciting for the Vergers Guild that the Presiding Bishop-Elect is very appreciative of the growing ministry of the verger. Recently Richard Parker, from Burlington and Mick Capon, from Durham met with Bishop Curry at St. Philip's Durham. During his episcopate Bishop Curry featured a weekly video blog for the diocese called, "Please Note." He asked Richard and Mick for an interview about the new chapter and about the duties of the verger. In the video, Bishop Curry made the observation that, "The verger is like a liturgical coordinator or conductor, sometimes visible and sometimes behind the scenes! This is sort of a liturgical concierge, a way of graciousness. I know when I'm traveling, it's so important for me to have someone to ask questions about a new place. That is a gracious and welcoming thing and it is at the heart of this ministry isn't it?" He summarized for viewers of the interview at the end of the video by looking into the camera and saying, "Really, the ministry of the verger is the ministry of a concierge in the church." Margaret McLarty, VGEC Immediate Past President and delegate to General Convention from the Diocese of Mississippi said, "I want to congratulate Bishop Curry on his election and thank him for his support of the ministry of the verger. We look forward to continuing this work together and hope to help make the church an energetic, welcoming and hospitable place for worship. We stand ready to assist in our local parishes and Bishop Curry and his vision for the church." The Vergers Guild of the Episcopal Church sincerely thanks all of the nominees who stood for consideration for this important position in the Episcopal Church and in the Anglican Communion world-wide. We pray for Bishop Curry as he begins the transition into this new chapter of his life and in the life of the church. 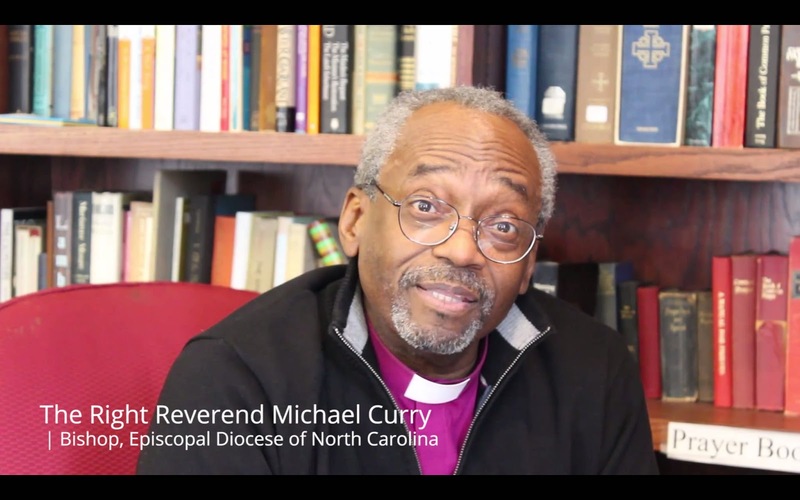 Abstract: Learn about the newly elected Presiding Bishop of the Episcopal Church. He was Bishop of the Diocese of North Carolina.